Discussion in 'Reviews , Video Reviews and Open Book' started by Nap, Feb 8, 2019. ......and as we will see in this release very much .."hands on"
One of the solace's in a soldiers life was the " services" offered by the sultler or camp women , the appropriate period name is “Trossfrau”, meaning ‘baggage train woman (or wife), who along with the children formed the ever growing baggage train , suffering alongside the hardships of campaign and often first to plunder. Of particular note is that the sword is individually wrapped to protect the delicate hand guard. Note : The fit of both heads to the pegs is really very good , no filling needed where the head met the neck. Consisting of a actual base with the framework , I would like to say that the fit is very well thought out with cutouts and insets being very well angled, there is a casting block to take away ...razor saw will do that with ease , all of the surfaces are wood textured , allowing washes etc to bring out the detail easily . You can see the pieces in the pic above. Zastrow.cuirassier and HIMINI like this. Position of the hand onto the females rear is good ....seconds before he gets hit by her left hand or the jug of ale !!! Mac1966, HIMINI and Zastrow.cuirassier like this. Facial features are very finely done , she wears a headscarf ..similar to the picture " The girl with the Pearl Earring"
Babelfish, Martin64, Mac1966 and 4 others like this. Very nicely done, but who's tempting whom, tempter or temptress? Martin64 and Nap like this. Nice review..must admit I scroll thru the references without much glance until I get to the meat of the review, then if promising may go back..but that’s just my way..you’ve turned it up a notch. Good Berthier, current affairs are settled, what do you think of my last review in planet figure? clrsgt, Nap, grasshopper and 1 other person like this. Now that’s a fine concept for a piece.. Excellent review thank you Kevin and what a character piece that is. These young Russian sculptors are so full of imagination and ideas that they are now (IMHO) the leaders in the figure world. THIS is what the hobby needs...not even more Crusaders, French Hussars, Romans in lorica armour and Celts! Babelfish, OldTaff, RantaN and 3 others like this. Very much so Gary..you nailed it..
Redcap and Nap like this. I'm working on this one as we speak and it is an amazing piece. The very sharp casting and fantastic detail make it a joy to work on. Even with my limited craftmanship this might turn out to be a piece that makes me proud. Great review as always. I am sorely tempted by this one. 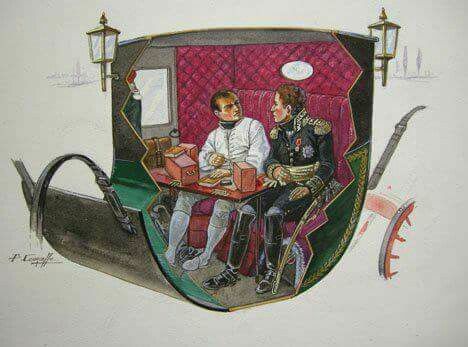 I also think that Napoleon and Berthier is a great idea as well. Excellent review great reference material.